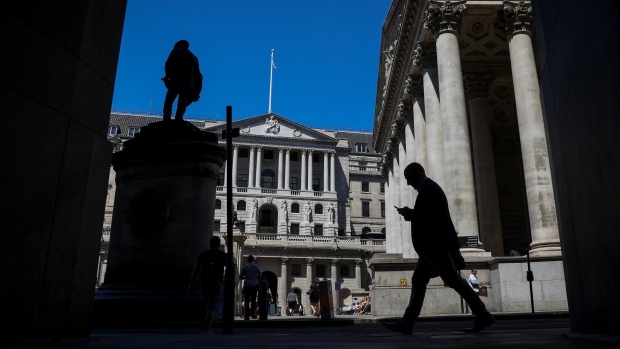 The BOE said that “uncertainty had intensified,” and now forecasts 1.2 per cent growth this year, down from 1.7 per cent predicted three months ago, the biggest downgrade since the 2016 referendum. The global backdrop has also weakened, as highlighted in the European Commission’s sweeping cuts to the euro-area economic outlook on Thursday. With Brexit hanging over the outlook, the bank said that its forecasts would need to be updated “once greater clarity emerged about the nature of EU withdrawal.” Acknowledging the huge impact of uncertainty, it ran an analysis showing that less uncertainty would lead to much stronger growth -- 1.6 per cent this year and 2.2 per cent in 2020. Assuming a smooth Brexit, policy makers reiterated that limited and gradual rate increases will be necessary. Nevertheless, the forecasts suggested that just one more quarter-point hike would be needed in the next three years to return inflation to close to the 2 per cent target, down from almost three hikes seen in November. In two years, officials see demand outstripping supply, implying some inflationary pressure building in the economy. In the near- term, inflation will drop below the BOE’s 2 per cent goal due to lower oil prices. Policy makers cut their prediction for business investment to a 2.75 per cent drop this year, having previously seen a 2 percent increase. They still see it recovering thereafter. The committee noted how sensitive its forecasts are to swings in the pound. A 5 per cent depreciation in sterling would lift inflation to 2.4 per cent by the end of 2021 -- versus 2.1 per cent in the current projections -- while a gain of that magnitude would drop the rate to 1.8 per cent.